After almost 40 years usage, HAZOP study is established as the most widely used technique for identifying deviations from design intent and assessing the potential consequences. It is fully recognised and recommended by legislators, regulators, insurance companies and other professional institutions. The technique is applicable at both the design stage, and throughout operational stages of production. It is also a vital tool when considering modifications to an existing plant. 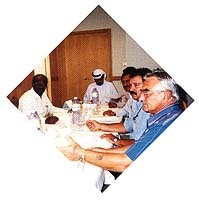 By means of a team selected for its expertise and experience, chaired by an accredited HAZOP team leader, a formal, systematic and rigorous examination is carried out to identify the causes and assess the consequences of perceived malfunctioning of equipment and associated operator interfaces. JENBUL have a wide range of experience in leading HAZOP studies including petrochemical complexes, combined heat and power units, pharmaceutical production, nuclear processes and natural gas installations.